Weight: 21.1 lbs. (9.6 kg) **For the SP C440DN when configured with three optional Paper Feed Units. Weight 40.6 lbs. (18.4 kg) **For use with the SP C440DN base model only. Weight: 29.5 lbs. (13.4 kg) **For use with the SP C440DN plus one or two optional paper feed units. Keep the information rolling Your customers need information quickly. Satisfy them with the RICOH SP C440DN, whose short warm-up time and fast first-print speed let you begin printing almost immediately. Churn through even the most complex jobs with a powerful processor that can handle multiple jobs simultaneously without compromising productivity for your office or workgroup. With the printer"s second network port, you can connect to two networks at once. Keep the RICOH SP C440DN on your standard network while adding it to a guest network, so visitors can print " without having to access the corporate (or your standard) network and potentially compromising your internal data or applications. Manage more types of paper stocks Deliver information that gets you noticed. Select from thicker stocks up to 140 lb. index (256 g/m2) to create postcards, brochures, menus and more in-house. Use any of the five paper sources to print envelopes and labels. Need to print something bigger? Use the bypass tray for banners up to 49" long. Take print productivity with you Work takes you everywhere " now you have a printer to support you. Send documents directly from your smartphone, laptop or tablet directly to the RICOH SP C440DN so you can print and share information from anywhere on the same network. Make your message clear What you"re sharing is important, so get your information across with vibrant colors and sharp text at up to 1200 x 1200 dpi. Eliminate outsourcing " custom PANTONE? color palettes (available February 2016) help you get the most accurate reproduction of PANTONE Matching System? CMYK process colors, so you can ensure your logos, borders and other graphics look their best. Help keep your information secure Keep tabs on your most important asset " information. With user authentication and locked print, you can help protect a document by restricting access to authorized users. Set up to 1,000 user codes to monitor user activity and set volume limits. Limit the number of IP addresses that can connect to the printer with IP address filtering. SSL/TLS protocols help keep network data from being intercepted. * Declared yield values in accordance with ISO/IEC 19798. Actual yields may vary based on images printed and other factors. The Ricoh SP C440DN ships with starter toner bottles that yield 3,000 pages each (5% coverage, two pages per job). For maximum performance and yield we recommend using genuine Ricoh parts and supplies. Specifications subject to change without notice. 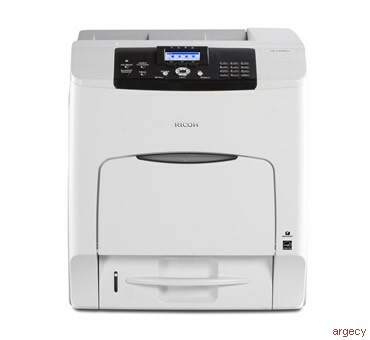 The Ricoh SP C440DN is under warranty against defects for a period of one year from the date of purchase. Consumables are under warranty for a period of 90 days from the date of purchase or until depleted, whichever comes first. Please refer to warranty documents shipped with the product for more details. **Declared yield based on 5% coverage, 3 pages/job and a 50% color ratio. Actual yields may vary based on images pritned and other factors.